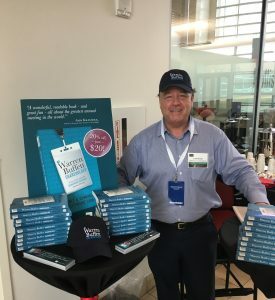 Author Lawrence Cunningham at the University of Nebraska yesterday morning for the Berkshire System Summit event, where he sold 15 copies of his book The Warren Buffett Shareholder before the event even started! Excellent work, and the hat looks great! Larry will be launching the book at Fordham University on Tuesday April 24th: https://news.fordham.edu/event/warren-buffet-shareholder-book-presentation-author-lawrence-cunningham. Note this event is now fully booked with a wait list.